There is such a great number of reasons to purchase a summerhouse. From using it for health, like with a garden sauna and spa, or gym, using a modern garden room as a garden lounge for a little garden holiday every day after work, working from the garden in your own garden office to just keeping the garden tools in there maybe together with a sofa for a little rest during the occasional rain shower that has interrupted the gardening. We have already introduced many possible sensible usages for such a summerhouse. But what can you do, if your garden is hardly larger than the size of a handkerchief? Don’t let that hinder you! We have summerhouses in our portfolio that would fit into your garden, even if it was just a size of 3×3 metres. But really: Even these small summerhouses of which we will present three examples in the following article are large enough to fit a comfy sofa and a table in there, a desk and a bookshelf, a small sauna, or a whole lot of gardening tools, and, of course, with the small size also comes a very affordable pricing. With just 4m2 of space inside the Monica S is one of our smallest models, but isn’t she pretty? With a single door and a little window next to it on the front side it really is decorative. A large roof overhang of 90cm over the entrance area will provide a seating space outside and a free look over the garden even when the rain is drizzling. 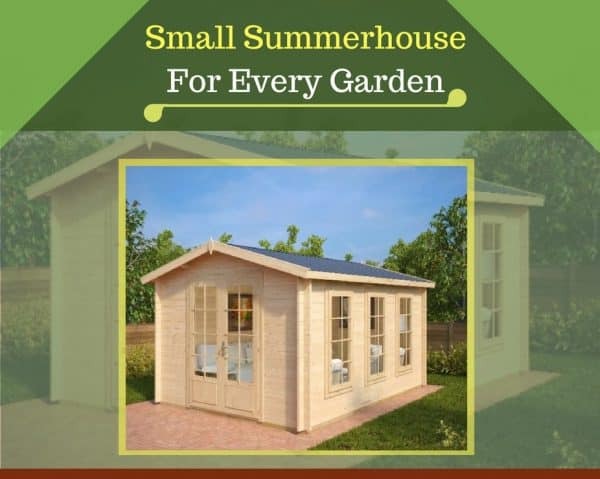 However, a low price and a small size does not mean that we compromise on quality: This small summerhouse has 28mm of wall thickness and 18mm strong floor and roof boards. Like all our models it comes with real glass in the windows, pre-treated foundation joists, roofing felt and a cylinder lock. The Monica S has under 2.5m of height, which makes it possible to erect it without a building permission. Hexagonal summerhouses are truly decorative. The Festival has a lot of glass only on the upper halves of the walls, which makes it look quite sturdy. Other hexagonal summerhouses like the Hexagonal Summerhouse Seattle or the Hexagonal Summerhouse Paradise feature larger floor to roof glass windows. Your choice. The Festival has 6m2 inside, however, it would still fit into your imaginary extra small garden of 3×3 m2. The inside covered by the low walls and the large French door would also allow for a usage as a storage room. The wall opposite the entrance is windowless, however, you can choose freely, at which walls you want to have its five windows. Also, decreasing the number of windows is an option. Anita L is called a shed because it has no windows except the two large windows in the large double door that opens up nearly all of it’s front side. With 6.2m2, it is our largest chosen model in this selection. It makes for a full grown garden shed, with more than enough space for tools, inclusive motorized tools like lawn mowers or milling machines, it can easily house a couple of bicycles, and due to much natural light inside through the large door windows it can also be used to relax during a break or for children to play in it. 28mm walls make for a sturdy construction, and a ridge height of under 2.50 metres will make it possible to build it without building permission. All models are made of kiln dried Northern Spruce and boast real glass windows, a cylinder lock for the door, pre-treated foundation joists, and a five-year warranty.